Toba and Earl’s relationship was straight out of a Hollywood script. They met at Jewish Summer Camp… she was 12, he was 13… and married 7 years later, never dating anyone else. Truly the loves of one another’s lives, the next 50 years blessed them with three children, grandchildren, an incredible social circle, success in business and philanthropy, and a strong commitment to their communities and causes. In 2001, their lives changed dramatically after Toba developed Alzheimer’s. The next 10 years brought them on a journey that thousands of local families face every day. They experienced the isolation, frustration, and exhaustion that goes hand in hand with caring for someone progressing through the loss of the memories they had built together. 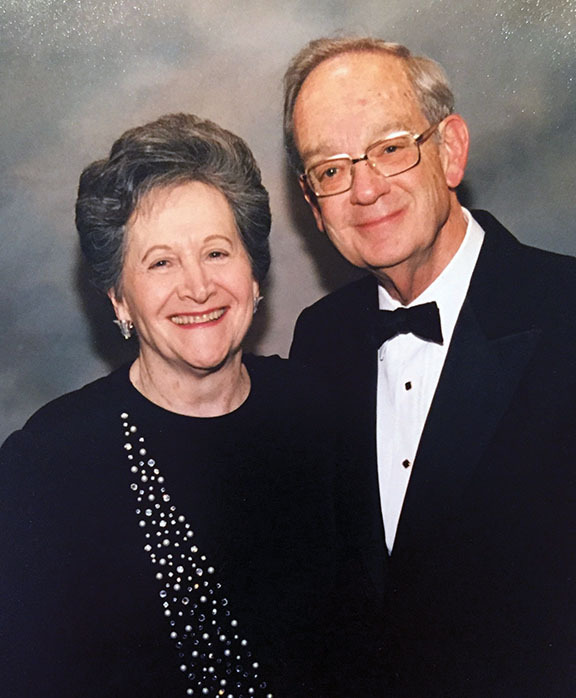 Initially Earl created the Toba Fund in honor of his beloved wife’s legacy… so that others would not have to face Alzheimer’s alone. Since 2007, it has raised over $500,000 providing 1:1 Care Counseling at no cost to anyone who needs information, education, and support from a master level social worker. Although Toba died in January, 2011, Earl remained passionate about making a difference until his death on September 06, 2016. Today Alzheimer’s Greater Los Angeles honors their love and legacy through the Toba & Earl Greinetz Fund. As a loving memorial tribute to Patricia Disney, her children (Susan Disney Lord, Abigail Disney, Roy Disney, and Timothy Disney) established The Disney Family Fund to benefit the Alzheimer’s Greater Los Angeles. The Fund supports programs and services targeting families from diverse communities across the greater Los Angeles area. The Disney family recognizes that Alzheimer’s does not discriminate; therefore, they are committed to ensuring that no one goes without access to essential programs, services, and resources. Regardless of race, ethnicity, religion, sexual orientation, geography, age, or socio-economic status… The Disney Family Fund provides support, education, and connections when people impacted by Alzheimer’s or dementia need it most. It has been written that Memories are a Blessing. When a loved one has Alzheimer’s or other dementias, they slowly lose their memories. But family and friends still remember ... and the Legacy4ALZ provides us a way to honor families and loved ones. Legacy4ALZ gifts live on forever. Join us by making a simple bequest, creating a charitable trust, purchasing a charitable gift annuity or contributing a property through a life estate to guarantee a stream of income for yourselves, and for future generations. When you join our Legacy4ALZ you will receive a special certificate acknowledging your gift, as well as exclusive invitations to special programs and events. If any of these topics are of interest to you, or you have further questions, please contact Gary Cohn at gcohn@alzgla.org or (323) 930-6201 or Sarah Jennings at sjennings@alzgla.org or (323) 930-6204. Gary and Sarah will be happy to connect you with a team member that can discuss your needs.